Whether you are a history nut or just looking for something interesting to do, the state of Iowa has not only a large amount of unique history to explore, but also a long list of monuments, memorials and libraries to help you immerse yourself in the Iowa legacy. From deaths on the Lewis and Clark Expedition to a “Palace of the Prairie,” the state of Iowa can keep you busy keeping up with your history for the rest of your life. To help you travel back in time and be a part of the unique history of Iowa, it’s worth your while to check out these top 15 historical sites in Iowa. Operated by the National Park Service, the Herbert Hoover National Historic Site not only celebrates the birthplace our nation’s 31st president, but also helps memorialize the legacy that he left behind. On display in the rural town of West Branch is the historic two-room cottage that Herbert Hoover occupied for the first nine years of his life, as well as an adjacent Presidential Library and Museum that gives valuable insight into the rest of the lifespan and career of perhaps Iowa’s most notable historical figures. Serving as one of the largest man-made grottos in existence, and commonly referred to as the “Eighth Wonder of the World,” the Grotto of the Redemption is an impressive architectural and historical monument dedicated to the life of Jesus Christ. No matter the religion you choose to pursue, this impressive roadside attraction is something else to experience as you travel through the nine grottos that comprise the entire monument, trying to understand that all of it was built by hand with the determination of local pastors to build something beautiful. Serving as one of 24 National Historic Landmarks in the state of Iowa, the General Dodge House in Davenport isn’t just a memorial for a historic building, it’s a monument to the man himself who built it. Grenville M. Dodge was a prominent 19th century railroad builder among many things, including a banker, a counsel to presidents and a distinguished Major General in the Civil War. Today, visitors can learn about this influential American and his legacy, all the while touring his decadent home near Fairmount Park in Council Bluffs. Touted as one of the most crooked streets in America, Snake Alley in Burlington was first inspired by the sprawling streets and vineyard paths of France and Germany. Connecting the streets of downtown and neighboring shopping areas across the steep Heritage Hill, visitors can either drive down or walk up Snake Alley, all the while admiring the century old craftsmanship and attention to detail that has made Snake Alley in Burlington a common tourist attraction for this riverside town. While Des Moines might be the residing Capital of Iowa, that designation was once bestowed upon Iowa City. These days, the Old Capitol building in Iowa City now stands prominently as a centerpiece for the University of Iowa campus, and contains a museum within its walls that displays the different heritages and cultures that have resided in Iowa over the last century. Surrounded by a vibrant collegial atmosphere, the Old Capitol building in Iowa City is a great place to learn a little bit more about the rich history surrounding Iowa. Serving as homage to the rich agricultural history that’s found in the fresh soils of Iowa, the Farm House Museum in Ames was once the first building on the Iowa State campus, and quartered plenty of distinguished and varied guests such as Iowa State presidents, students and various farmhands who traveled from across the state. First established in 1860, over a century later this unique testament to Iowa history was transformed into a museum you can visit today. Designed by the same architect that built that old state capitol in Iowa City, the Dubuque County Jail, constructed in 1857, still stands proudly today as an eye-catching architectural wonder and unique display of history. At one point in its life, the Dubuque County Jail held confederate soldiers within its cells, and today you can walk through the building and view the significant collection of the Dubuque’s Historical Society’s artifacts and relics from the city’s long history. Standing high above the ground in Larsen Park of Sioux City, the Sergeant Floyd Monument is an impressive 100-foot obelisk that commemorates the final resting place of the only member to die from the Corps of Discovery, otherwise known as the Lewis and Clark Expedition. Complete with a visitor’s center and museum, the Sergeant Floyd Monument is one of many historical points of interest along the Lewis and Clark Expedition, and the only one overseen by the National Park Service in Iowa. Grant Wood not only was born and raised in the state of Iowa, but much of his inspirations came from the surrounding landscape. In the small town of Elden in Southeastern Iowa, you yourself can see and be a part of perhaps one of Wood’s most notable pieces of work, the American Gothic House. Primed and ready for your own photo moment, the American Gothic House also provides an adjacent American Gothic House Center to learn all about the fascinating life and history of perhaps one of America’s most famous painters. For a unique view of Iowa’s History, the Effigy Mounds National Monument in Harpers Ferry gives you a look at the cultural remnants of the people that inhabited the lands before Iowa ever became a state. Spread throughout this scenic Western Iowa landmark are mounds of varying shapes and sizes, all designating cultural significance for American Indians who used to inhabit this fertile area. It’s still a mystery exactly what the monuments represent, and the only way to formulate your own opinion is by visiting the mounds yourself. Like many significant cultural Americans, John Wayne, A.K.A. “the Duke,” was born to humble beginnings. First known as a young man by the name of Marion Robert Morrison in the small town of Winterset, the now-famous movie actor moved out of his hometown at an early age to forever change the world of movies, but visitors can still see where this influential American was born in raised in his small Winterset home, and learn about his life and career in the adjacent John Wayne Birthplace Museum. As inspiration for the 1992 best-selling novel of the same name, the Bridges of the Madison County already had a great deal of historical and cultural significance before the book was ever published. Serving as the largest group of covered bridges in the western half of the Mississippi Valley, the six scenic bridges that make Madison County the Covered Bridge Capital of Iowa provide the picture-perfect opportunity to look back into a world that is rarely seen in present times. There is a lot to offer at the Brucemore Historic Site and Community Cultural Center including concerts, performances and beautiful garden and home tours, all surrounded by the fascinating history and aged ambiance of this historical mansion. Occupying over 26-acres in Northeast Cedar Rapids, Brucemore has been and continues today to be a significant historical and cultural keystone of the surrounding community, and is well worth the day, weekend or lifelong exploration the premises can provide. 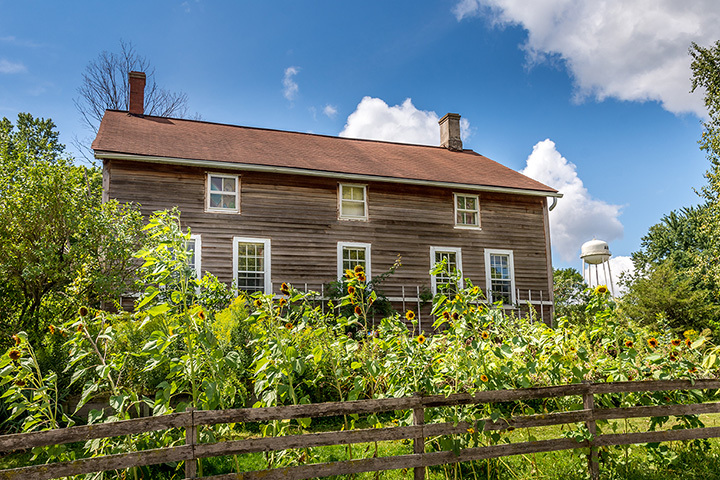 For an opportunity to sit back and experience a different pace of life, the seven different villages that comprise the total Amana Colonies is a welcomed refresher from the normal hustle and bustle. Whether you are shopping for some hand-crafted accessories, or dining out at one of the many quaint, fresh-made eateries, your whole visit to Amana will feel like a historical step back in time as you experience a simpler slice of life and outlook on a unique Iowa community. Home to the current Governor’s Mansion, Terrace Hill has a prominent place in Iowa history. First built in 1869 at a whopping cost of $400,000, this “Castle among Cornrows” was conceived by the state’s first millionaire, Benjamin Franklin Allen. Since its historic inception, the mansion has housed bankers, celebrities and is now home to Iowa’s first family, welcoming over 10,000 visitors a year to walk through history and be a part of Iowa history. View more Iowa Historical Sites.